Mike Reveals Scambot 2 Song Secrets! Hey Ms. and Mr. Everyone! 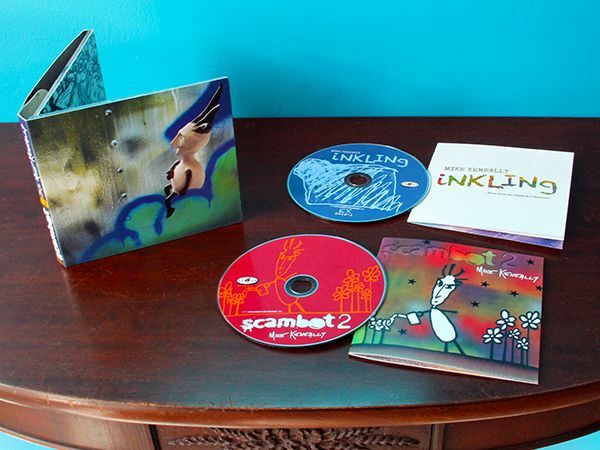 I’m very grateful for the first wave of listener response to Scambot 2, which has been heartwarming; really gratifying reactions from the people who’ve heard the advance download they got after ordering the 2-CD special edition. Thank you to all of you who’ve had good words about the album so far! 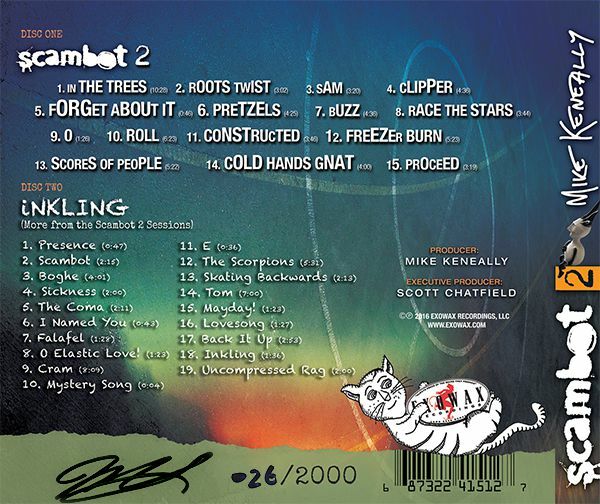 I want to shine some light on Mike Harris, who engineered the majority of the recordings and who mixed all the songs on both Scambot 2 and Inkling. He really demonstrated angelic patience while I worked on multiple versions of some tracks, got microscopically obsessed with mix details, and re-recorded vocals after re-writing lyrics. Mike achieved a really warm sound, and the many layers don’t overwhelm the ear – I’ve never enjoyed the sound of any of my albums as much as I enjoy this. And more light must shine on Scott Chatfield, who supported the entire undertaking in every way, with great patience and understanding as the songs took shape in his home, over a very lengthy gestation period. The first song is “In The Trees,” which is the craziest song on the album – it was intentional, from a narrative/musical perspective, to start the album at maximum density and then gradually let more oxygen into the sound as the album progresses. The skeleton of “In The Trees” is the main rhythm guitar part, played on a Fender Baritone. The opening melody came to me while standing next to a row of shopping carts in a soul-deadening department store, and I stood singing it into my phone whilst my girlfriend patiently waited for me to grab a cart and start shopping for sundries. My daughter Jesse and Ben Thomas helped me out vocally on this one, the one song on the album which is most explicit about vocalizing the different characters. I didn’t want to have each song sound as though it was sung by the different characters (that would be more of a “rock opera” album than I cared to make) but for the dramatic, over-the-top nature of this song, it made sense. 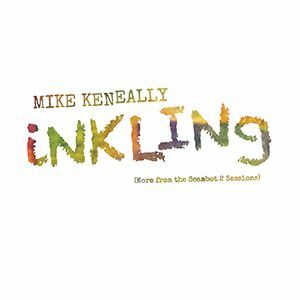 Kris Myers recorded the drums for this song, as well as “Sam,” “Buzz,” “Constructed” and “Freezer Burn” (PLUS “Falafel,” “Tom” and “Back It Up!” off of Inkling, the second album in the 2-CD special edition) in one single-day marathon recording session at Transient Sound in Chicago. Truly a super-human feat of endurance and skill. We recorded Pete Griffin‘s bass in his bedroom. This album encompassed a lot of locations and times and it was some work making it all sound cohesive – the Mike Harris magic at work. “Roots Twist” is one you might remember from a video we posted over two years ago of us recording the vocal parts in the living room. It sounded cool then, but really bloomed into awesomeness for me once we recorded Bryan Beller‘s bass and Joe Travers‘ drums for it last year. The rhythm section KILLS on this song. If we were releasing singles from the album, this would be the first one. This one was also built from the guitar part up, and I wrote the part standing next to Mike Harris in the studio, section by section. I knew that I needed a song that felt like this one, but didn’t know yet what the actual notes would be – it was fun coming up with the parts on the spot and having Mike H. capture them for me, listening back and deciding what the next part should sound like, and by the time I was done composing the structure, the main rhythm guitar part was already recorded. It’s a fun way to write, and one that I employed for many songs on this album. “Sam,” on the other hand, was a fully composed piece prior to me bringing it into the studio, and it was based on a guitar chord shape I’d never happened upon before (if you’ll permit me to get tech for a sec, it involves playing a triad with the 5th note of the scale on the fifth string, the 3rd on the third string, and the 1st on the first string – i.e., the first chord of the song, G major, has the D on the 5th fret of the A string, the B on the 4th fret of the G string, and the G on the third fret of the high E). That was a starting point, and then finding a second different but complementary chord shape, and moving that around the neck, very quickly gave me a chord progression I found really complete-sounding and pleasing, and somehow wistful enough to support a lyric about Ophunji actually displaying evidence of humanity (so to speak). The guitar part in the chorus is obviously me channeling my inner Neil Young. And the guitar solo is a bit of a Coltrane injection, so if you recall the song “Wooden Smoke” which alludes to both of those titans, this song is kind of a musical reference back to that. I think Kris Myers initially thought I was insane when he heard how I chose to layer two different drum takes in the guitar solo in order to achieve a seriously undulating rhythmic ebb and flow for the guitar solo to float over, but over time he began to understand the method in my madness (I think. I hope). Next Keneallist I’ll deal with “side two” (speaking of which – when we asked you to take that survey about formats a while back, very few of you showed a specific interest in vinyl for this release, so initially at least, we’re not doing vinyl. If the album seems to catch on with people in its 2-CD and download formats, we may revisit the idea of vinyl. We do really love vinyl and still have fantasies of releasing my music that way, but we’ve got to be sensible about it). 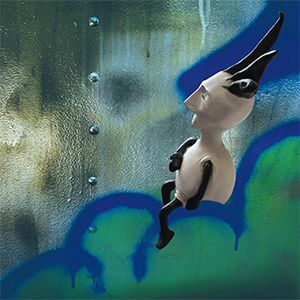 In closing I want to say a couple of things about the artwork – first off, the Scambot figurine on the cover was constructed by Dane Runyon, a musician/composer of wond’rous gifts whose debut album Looking Below () I produced. He gifted me figurines of Scambot and Ophunji. Scott photographed the Scambot figurine in the kitchen, and then Atticus Wolrab placed it, through the magic of art, into its present fantasy environment. Many thanks to you, Dane, for your gift, and for your contribution to what is my favorite album cover of any we’ve released. And re: Atticus, who refuses to take art credits on my albums anymore, for reasons; he can’t stop me from talking about him here. He’s once again done stellar work with this album. And in addition to all the design work and his manipulation of my goofy drawings in the booklet, he also did the drawing which occupies page two of the digital booklet, a radical reimagining of my characters in an explosion of Aoxomoxoa-tude. I love it, and need to thank him openly for it whether he likes it or not.